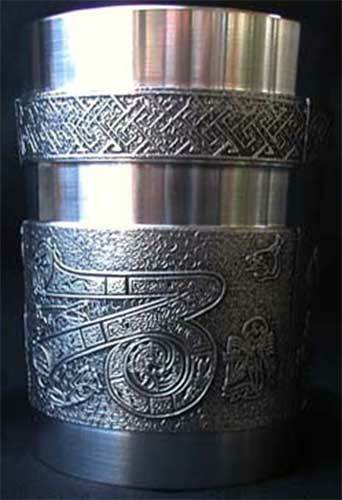 Pewter whiskey glass features an ornate letter Z along with Celtic knot-work from the Irish Book of Kells manuscript. This pewter whiskey glass features a Celtic design from the Book of Kells that is enhanced with knot-work along with the letter Z. The Irish whiskey glass is a lowball or double old fashioned size that measures 3" wide at the rim and stands 4" tall; the 10 ounce glass is made of lead free pewter.